OO-SLR Boeing 767-3BG(ER) (c/n 30563/786) at Amsterdam IAP on 02Jun02. The largest charter airline in Belgium was declared bankrupt on 19Jan04 and suspended all its operations. 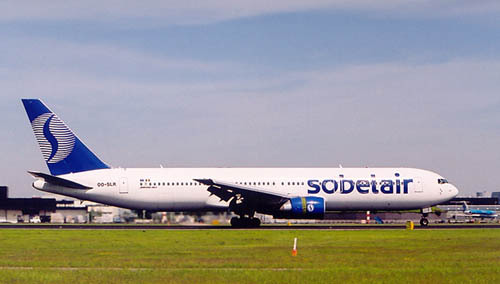 Sobelair was formerly Sabena's charter subsidiary and survived the National airline by only 2 years. It was unable to find a viable plan to continue operations. It's long career began in 1946 and Sobelair was acquired in 1948 by Sabena (100%). Plans to be taken over by Preussag (TUI) in 2001 failed. 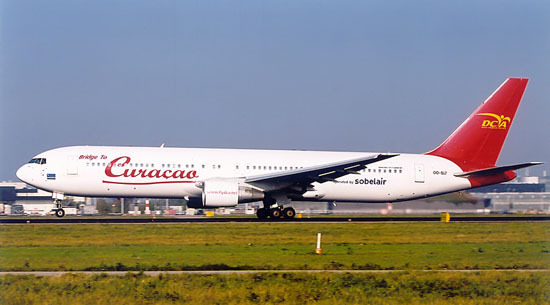 Upon Sabena's demise it was acquired by Aldo Vastapane (dba Belgian World Airlines) in 2002. It is expected that remains of Sobelair will live on in TUI-owned Sunrise, which is to start operations during 2004. OO-SLT Boeing 767-330(ER) (c/n 25208/381) leased by Dutch Caribbean Airlines (DCA) at Amsterdam IAP on 28Oct03. Unfortunately, these trans-atlantic operations did not prove to be the lifeline they were supposed to be.